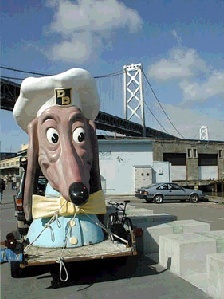 A smart-looking Doggie Diner head at the Bay Bridge, mid-1990s. For tenants (at least 60% of the population) San Francisco is a cat city, owing to its paucity of open green spaces. Dog owners are an embattled minority. Their animals' soil coat every square inch of grass, making lawn play a dangerous pastime. 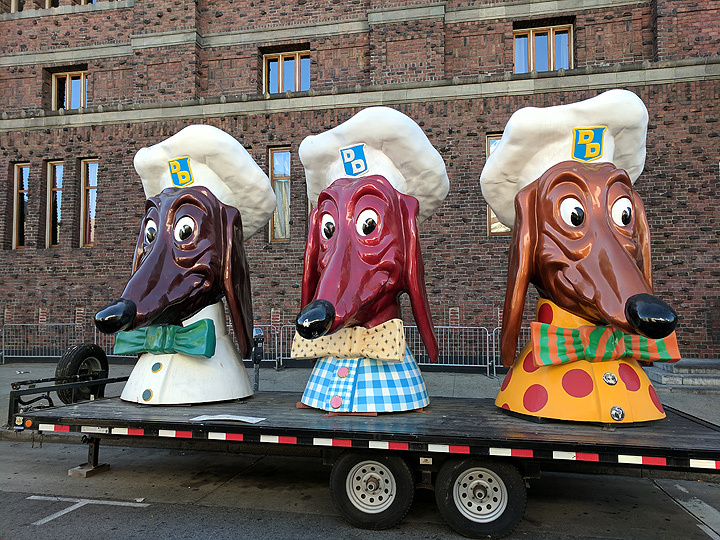 Even so, Dogs are the objects of worship -- particularly the kitschy dachshunds-on-sticks that were left behind by the defunct Doggie Diner chain of fast-food restaurants, among the first of their kind in the years following WWII. (The chain was based in Oakland.). 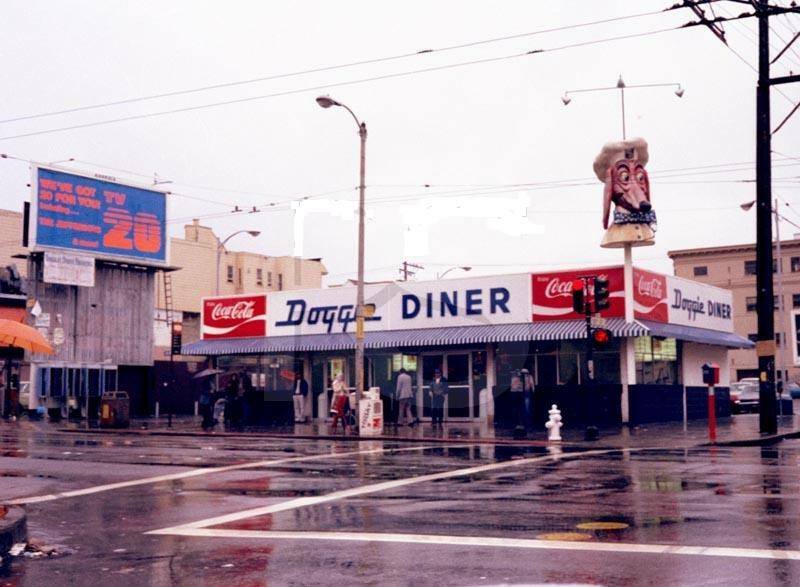 Doggie Diner at 18th and Mission, c. 1980. 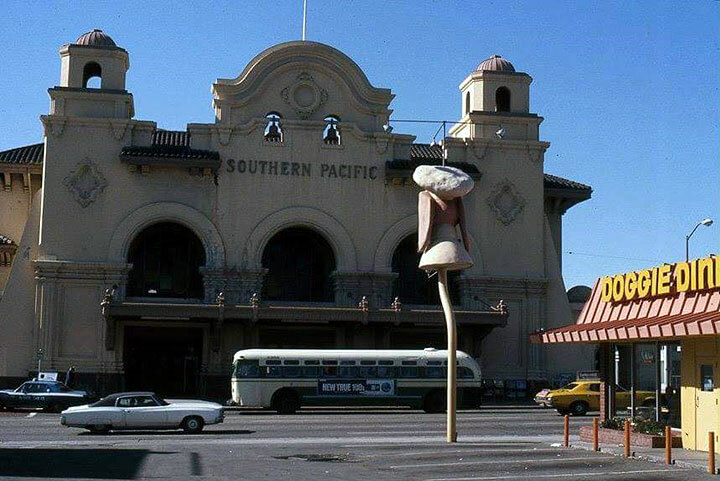 Doggie Diner staring across at the Southern Pacific Depot on 3rd at Townsend shortly before its demolition, 1975. John Law owns several of these abandoned canine icons, at one time storing them at the We-Be-Dudes ranch in Glen Ellen where Don Herron then lived. Biplane tours over Sonoma County veered course to soar over the ranch and gape at these imported Dog deities. 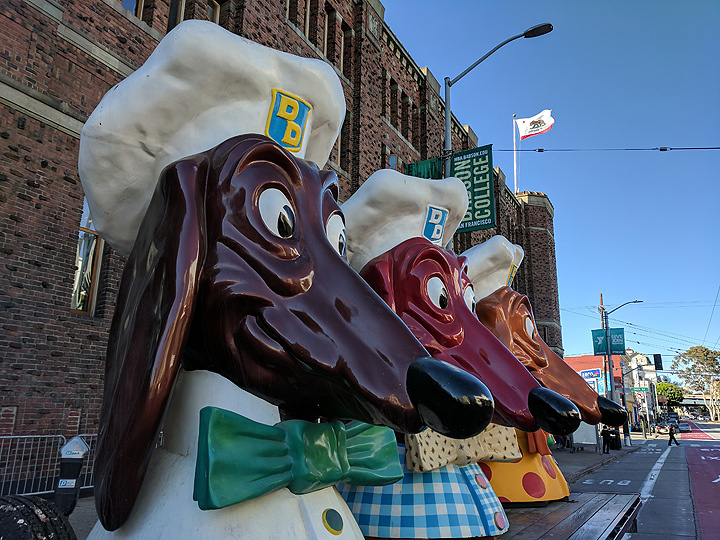 A Dogminican Order was founded with pilgrims flocking north from San Francisco to pay respects, and offer ritual sacrifices to the Divine Dachshundry. In recent years, the Dogs have been seen outside Modern Times bookstore during a signing by Bill Griffith (whose Zippy the Pinhead has many a run-in with the Dog heads). The Dogs are a seen at parades: How Berkeley Can You Be?, the annual St. Stupid's Day Parade, and the Art Car caravan that wends several score art-enhanced vehicles from around the world for a spin through the City and environs. 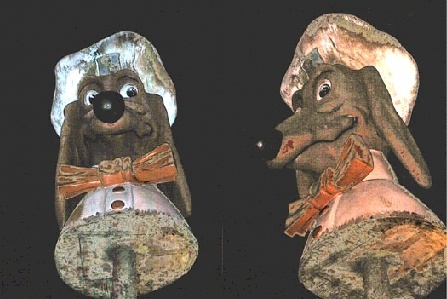 Two Doggie Diner Heads in the 1990s. Sadly as 2000 dawns, the last in situ Doggie Diner head at the end of Sloat Blvd. is threatened with removal. Believers in the Dog and civic history have lobbied for Landmark status to be conferred on this left-over fiberglass mutt from an extinct chainstore. Its future is uncertain; there is doubt that the City Supervisors will act to preserve the Dog head at its location in Ocean Beach despite the petitions of a range of activists and believers in the Dog. Not everyone's nostalgia is linked to the passion of carnivores for dead meat, the hot dogs and hamburgers that were served at the Doggie Diner. Many who missed the Diner's meaty offerings (the last one closed in 1986) see in the Dog the Ideal Animal: well dressed, happy, eager to serve one's soul as it once did one's flesh-eating appetite. As Marcelle Clements has observed, The Dog is us. Arf Art! 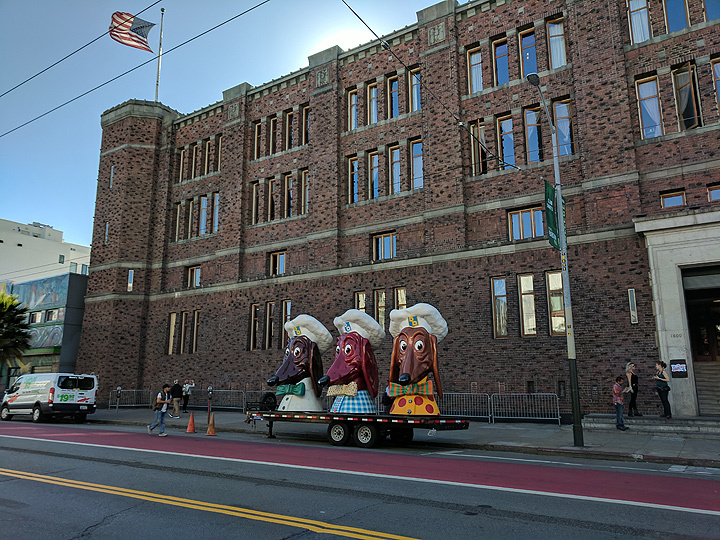 The Doggie Diner heads in October 2017 outside of the former Armory for a pet-related event inside... by now they've been fully renovated and rejuvenated and make their regular appearances via flatbed truck.